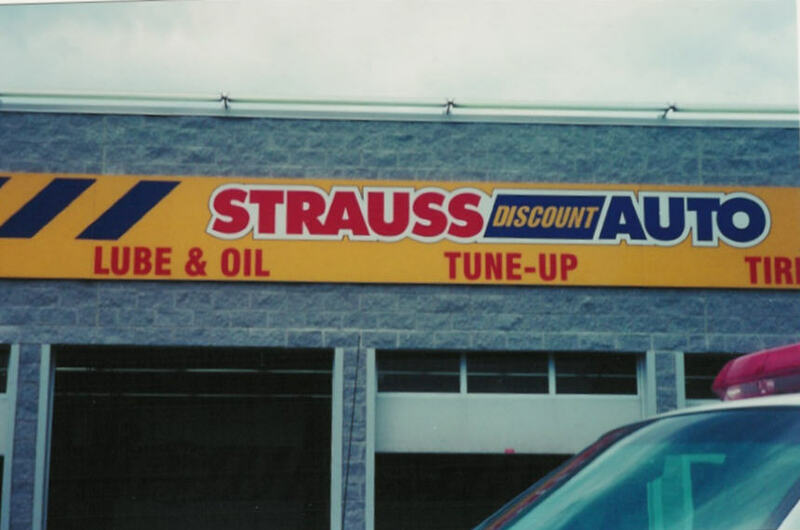 The Intercontinental Champion arrived at Strauss Discount Auto, Bloomfield, N.J. - greeted by hundreds of eager fans. Bad weather and even worse traffic meshed together to cause our favorite son to be about an hour late for this appearance. 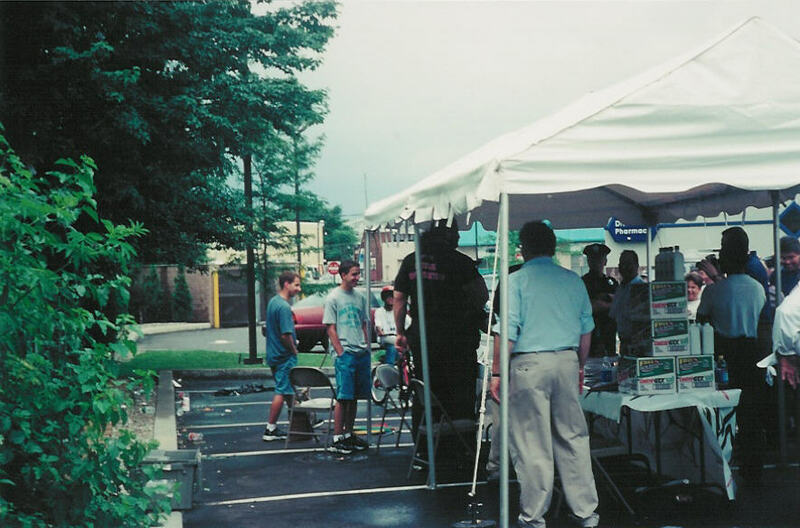 Once there, he finds himself sitting on a steaming hot blacktop, under a canopy - yes, but the heat and humidity must have served as a constant reminder of what Hell is like. 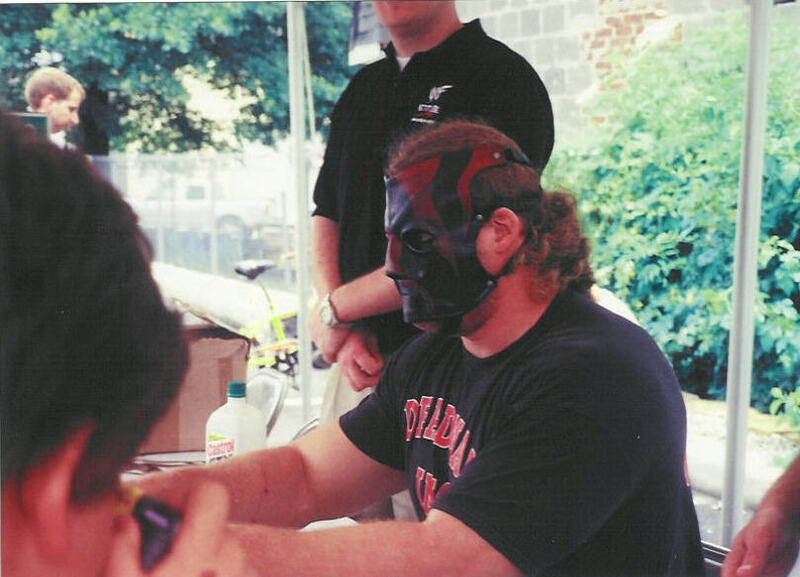 Undaunted by the clime, KANE took up marker and humble disposition and began greeting his fans. 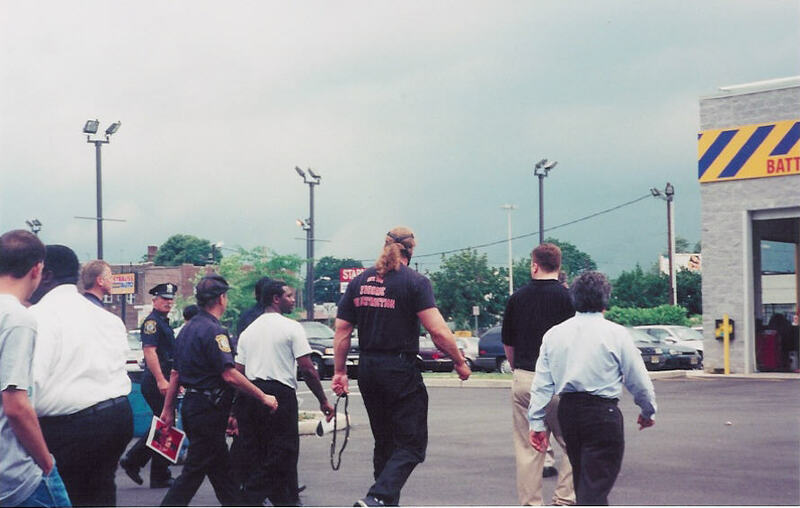 Once inside the "compound" I looked around and realized that KANE had passed me on the way in! LOL! - I was sitting at the light just up from the store, when a police SUV behind me suddenly turned on it's lights and siren, pulled around me and slowly started through the red light. A black and charcoal grey limo pulled into position behind the SUV while another police unit followed the limo - lights and siren again'. As I watched - envious of the "special" treatment SOME people get - they pulled into the drive of the store. Oh, GREAT, I'm thinking, The owners of the store are here -KANE is finished, and I drove ALLLL the way from DC for nothing! I started into the drive, but was waved to backup and pull into the shopping center lot. 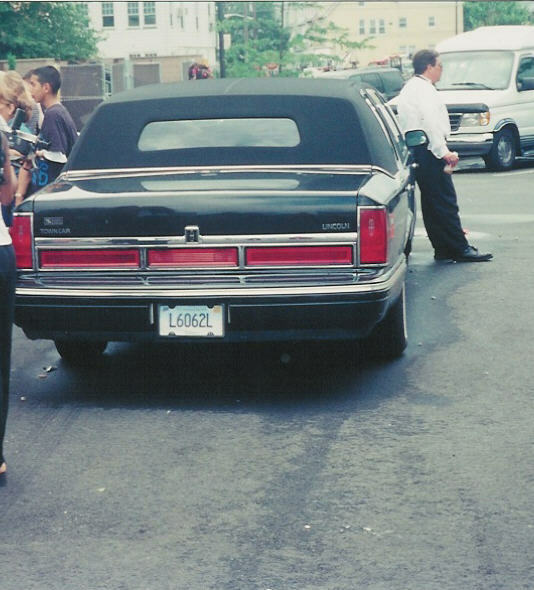 Imagine my surprise when I saw that limo and realized who had been in it! 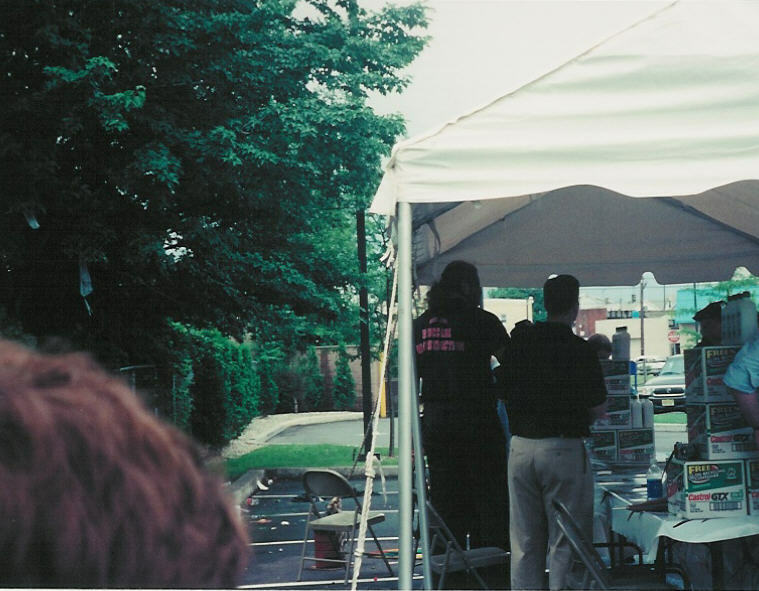 The line was long - it kind of wound out - serpentine like - from the table where KANE was sitting, and stretched across the auto store's parking lot. 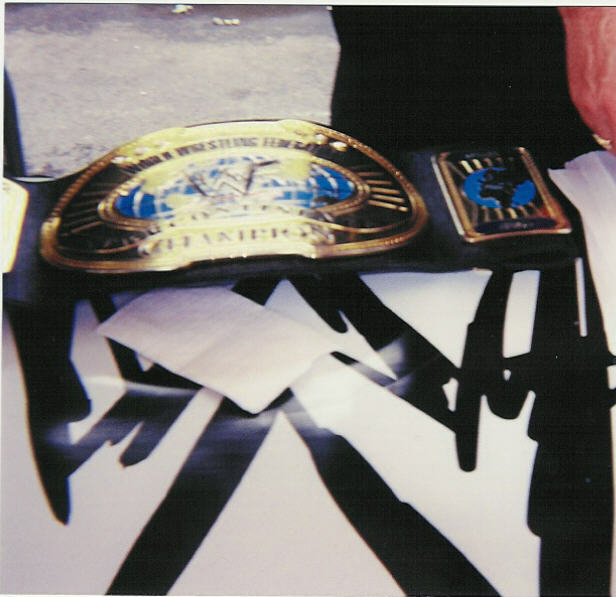 The fans seemed to be cheery as well as excited, and as Martin, my ten year-old, and I took our position at the end of the line, we instantly were drawn into wrestling conversation. Fifteen minutes into the wait, it poured! My FIRST thought - please forgive my unsportsman-like conduct - was YES! SOME of these fans will leave, and we can move up really quickly to the head of the line. RIIIIIGHT! No - these were die-hard fans! They stuck it out - KANE stuck it out. 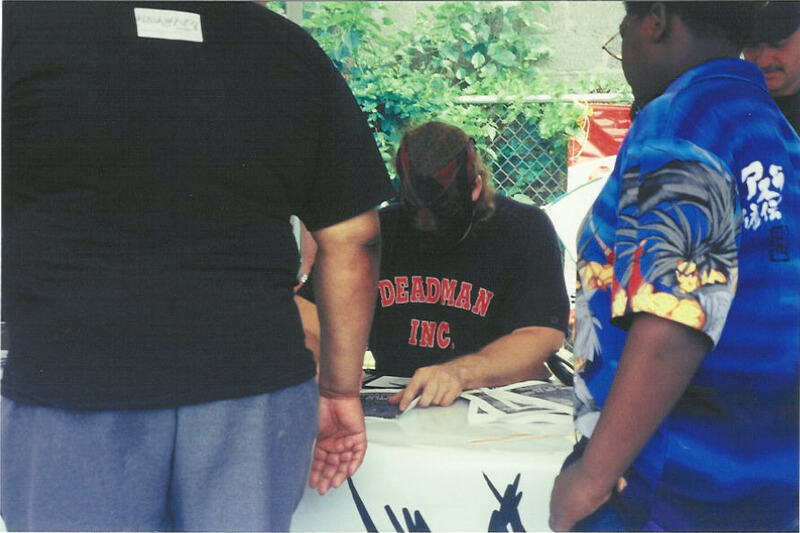 KANE signing autographs - I even enjoyed watching him performing THIS task! KANE had given his little head tilt to this young lady! Martin couldn't get the camera up fast enough! LOL! He had a few words for each person as he signed, and he shook each fan's hand before they left him. Yes - he DID have the white contact in - It's a sinister thing to see up close! FINALLY! Standing before the IC Champion! KANE turns his attention upon Martin. He's waiting for the kid to give him the photocopy or SOMETHING to sign - MY son chooses this moment to perform his imitation of a goldfish! Giving Martin a inconspicuous nudge as I walk around him, I gently remind him to say "Thank you". That got his attention - as Martin gave me THE groan, KANE bent his head to sign his autograph to the paper Martin had finally handed over. LOL!! Looks like KANE's chatting with someone - Well, what he said to Martin was "Here ya' go Lil Bro." (Something dropped down to my knees at the sound of his voice - the Glenn Jacobs/nonKANE voice) They shook hands - my son's small one lost completely in KANE's just to above the wrist - Martin giggled, then extended to KANE a photo of himself in his wrestling gear, posing in his favorite wrestling stance, complete with his wrestling stats on the back. KANE did a kind of double take, took the photo, flipped it over, glanced at the back, flipped it forward again and looked at Martin then at the photo again. "OH! Hey! That's NICE! Keep it up Lil Bro!" He really sounded surprised! Martin had a grin as wide as the Grand Canyon as he stepped away toward me. He turned around as if he'd forgotten something - and said, "Thanks Mr. Jacobs!" I groaned - KANE said "O.K. Lil Bro" and as Martin brought his camera up KANE posed for him! After adding another "Thank you!" 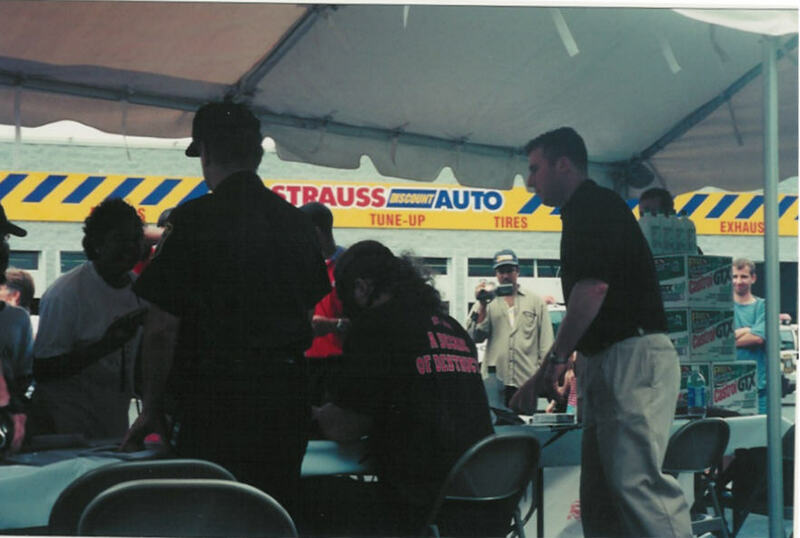 Martin skipped away - singing something about never washing his hand again, and he got KANE's autograph and I didn't. Believe me - two days later, and I could SWEAR his feet haven't touched the ground yet! Since it had taken about 5 and a half hours to get there, and would probably take me that and an hour more to get home, I decided to stick around 'til the end, taking photos, chatting with some of the other fans, and being near KANE. 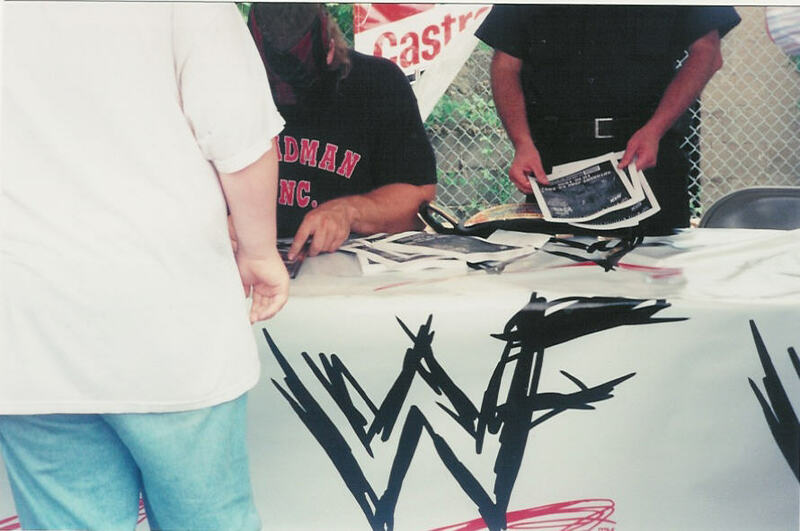 As I've stated on the main message board at Kane's Forbidden Hell (I'm feelin a bit like Foley here [displaying toothless grin]) KANE greeted fans and signed autographs steadily for two plus hours! Martin and I were close to the end, and he was as gracious and cheery as if he'd just started. The man's PHENOMENAL in this fan's opinion. He just keeps goin', and goin', and goin'! I don't think there are many wrestlers as deserving of the title "SuperStar" as is KANE. 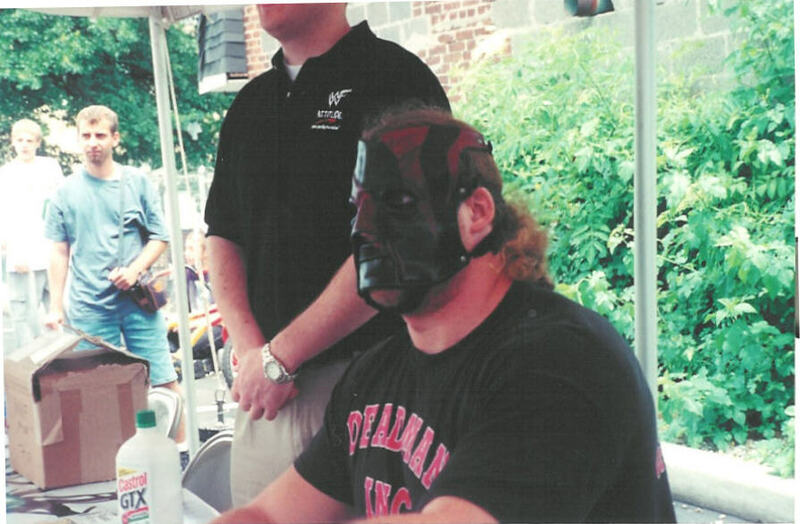 Having penned his name and greeted the LAST of his fans, KANE roared out "YES! ", clapped the marker to the table and gave a little laugh. We started clapping, and whistling and Francisco brought around some of the large promotional posters and asked him to sign those. Ever indulgent, KANE took up a marker and proceeded to add his moniker to them. Then he stood up - and up and up! He gave a little laugh. More clapping from the group surrounding him, as he turned to talk to the two guys that pretty much stayed by him the entire time. It was time to go - KANE's day was FAR from over. 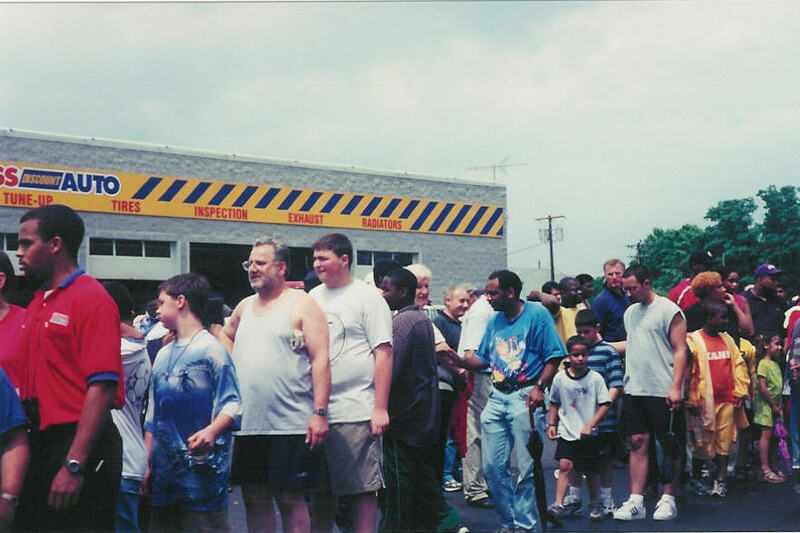 He went inside the store through the service bays, the mechanics scrambling to get out of his way (FUN-NY!) and met with the store's staff. Then it was off to rest up (I HOPE) and get ready for the house show in Trenton - he was to face Big Show. 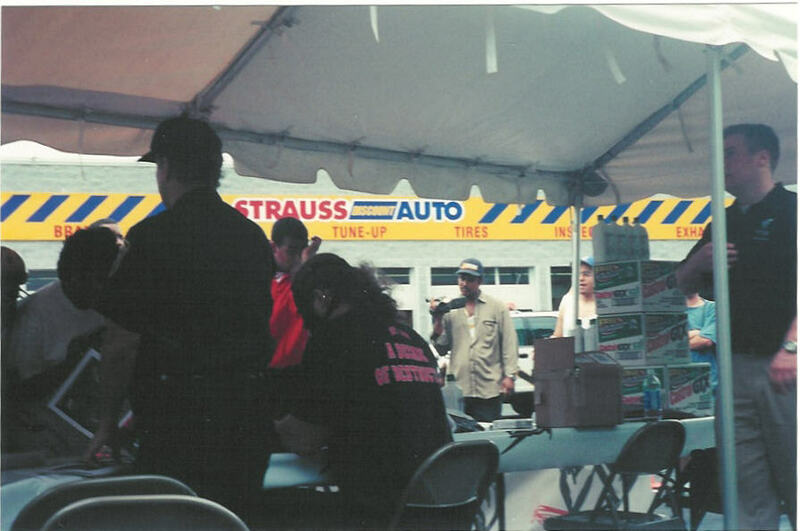 The 11 plus hours I put in driving was well worth being able to see KANE and watch him interacting with his fans. I entreat any of you - if you get the chance to meet the Towering Titan - DO IT! 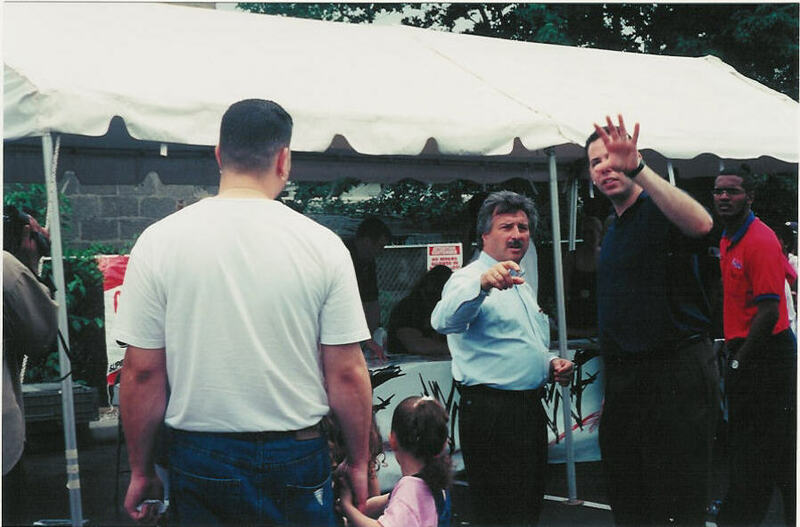 KANE responding to Martin calling out another thanks - and me tellin' him the gals at Kane's Forbidden Hell say HI! The Intercontinental Belt - NO ONE has deserved it more!